On Tuesday, June 18th, composer Alex Weiser presents the first act of his opera State of the Jews as part of his Roulette 2019 commission. Born and raised in New York City, Weiser creates acutely cosmopolitan music combining a deeply felt historical perspective with a vibrant forward-looking creativity. 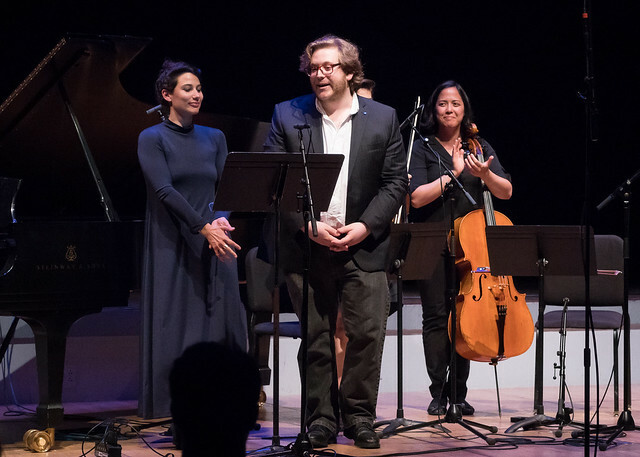 Alex Weiser and the performers of his May 2017 commissioned work “And All The Days Were Purple” onstage at Roulette. Photos by Steven Pisano for Feast of Music. I’m a composer, concert curator, and event producer. I was born and raised in New York City. I write music drawing inspiration from literary sources, ideas or inter-textual relationships from the history of classical music, and often from my fascination with and personal connection to Jewish culture. I helped run the MATA Festival for about 5 years and founded and continue to direct the new music series, Kettle Corn New Music. I’m working on a historical-drama opera about Theodor Herzl (1860-1904), an Austro-Hungarian Jewish writer who, in response to rising antisemitism around the turn of the 20th century, ignited a movement supporting the idea of a Jewish homeland. The opera, which I’m writing with librettist Ben Kaplan, explores some of the little known details of the politics of that time and also interweaves the story of Theodor’s relationship with his wife, Julie, and the toll that his political work took on their marriage. Julie provides a stark, contrasting response to the same set of historical circumstances, exposing the complex and in many ways still un-resolved challenges of that moment. One of the things that really fascinates me about this story is that even with the benefit of hindsight, its meaning in history still remains fraught and contested. Steve Reich’s 1980 “Octet • Music For A Large Ensemble • Violin Phase” is a long time favorite of mine that I return to often. I love how its surface bubbles with ecstatic energy, while underneath there is a broader sense of meditative stillness, and on yet another level, all of this is flowing in an always unfolding developmental arc. Besides, it’s just totally beautiful music. What is influencing your work right now? For the past three years I have been the Director of Public Programs at the YIVO Institute for Jewish Research where I have curated and produced programs exploring and celebrating the rich history and culture of the Jewish people (with a particular focus on Yiddish speaking Jewry and their diaspora). YIVO has been a thought-provoking and inspiring home base for my work, and some of the stories, music, and literature that I have encountered there have made their way into my work as a composer. What is your favorite Roulette memory? I was at a concert at Roulette in December 2012 which featured John King’s Astral Epitaphs performed by TILT Brass and the Brooklyn Youth Chorus. The piece had this incredible urgency and visceral power. John had the chorus surrounding the audience on the balconies, and there was this moment where they suddenly entered, with their sound enveloping everyone from all sides. I was really blown away by the experience and I loved the way the physical space and directionality of the sound became a part of the composition. Alex Weiser: State of the Jews takes place on Tuesday, June 18th 2019 at 8pm with vocalists: baritone Mario Diaz-Moresco, mezzo-soprano Augusta Caso, tenor Chad Kranak, bass-baritone Adrian Rosas, and the Os Ensemble choir directed by Raquel Acevedo Klein and musicians: pianist Marika Bournaik, cellist Julian Schwarz, violinist Avi Nagin, and clarinetist Bixby Kennedy.